You may remember that I mentioned something in my previous newsletter about a project with the Hoedspruit Endangered Species Centre (HESC) Well, last year we visited HESC with friends from abroad & after the informative video we saw & the tour, we were so impressed with all the wonderful & professional work they do there, that I knew I wanted to help/ contribute in some way. I left my contact info at the desk & a few months later the founder of HESC, Lente Roode, called me. She shared her story about how the centre came about & we discussed some practical options about how my art could be used to help raise money for the centre. We decided on a painting of one of the cheetahs at the centre. As Lente goes over to New York annually to raise funds for HESC this would be the perfect opportunity to take the painting along & auction it off. 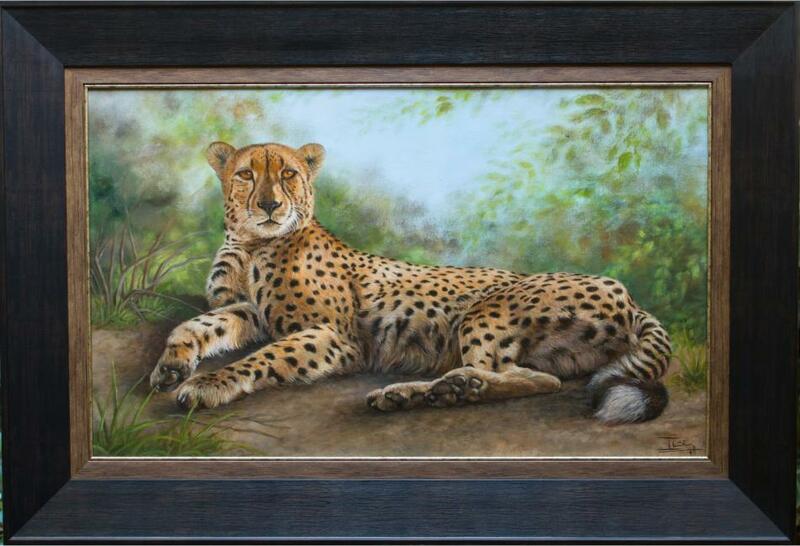 She also suggested I do a painting of a cheetah named â€œCrunchieâ€. This male cheetah along with his sibling â€œSmartieâ€ were handraised by Lente after their inexperienced mom kept on leaving them out in the cold & rain. The female â€œSmartieâ€ was always wild at heart, but Crunchieâ€™s calmer disposition made him perfect for the role as â€˜Cheetah ambassadorâ€™ for the center. In May my husband & I went to HESC & took numerous pictures of this beautiful cat so that I could have a wide choice for possible reference photos. 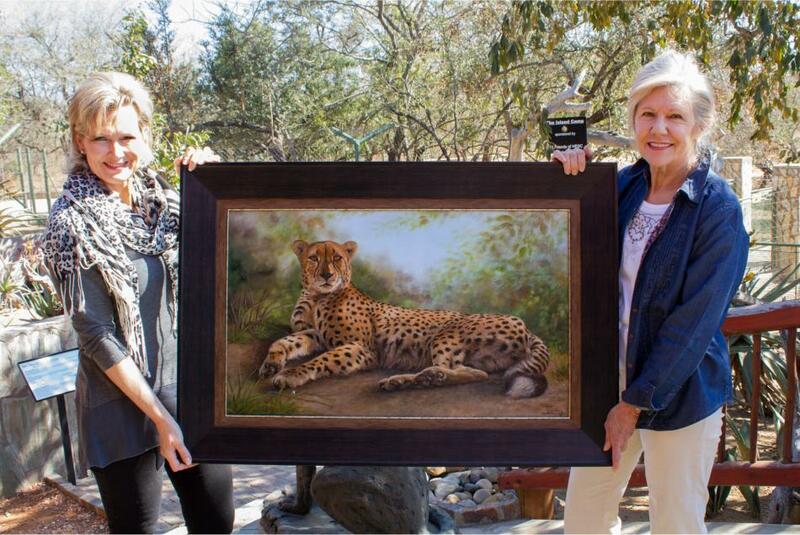 This past weekend we went to HESC to meet Lente in person & hand over the painting. What a wonderful morning & what an amazing lady & conservationist! I am so excited to be part of such a worthy project & we are all holding thumbs that the painting reaches a good price in NY in September. For anyone of you that would like to know more about the Hoedspruit Endangered Species centre, please visit www.hesc.co.za or follow them on Facebook. They post regular updates & there are wonderful stories to follow. For those of you that are even more enthusiastic about wildlife & also want to get involved in the wonderful work they do there, there is a â€œCheetah adoption programmeâ€ & a â€œFoster a rhinoâ€ programme available. If you want to follow up on any one of these options please email Karen Swiegers at the centre (management@cheetahcentre.co.za), sheâ€™ll be more than happy to assist.